What a fun idea that both the kids and the parents can enjoy! Throw a 50’s themed partywith LEGO stations as the entertainment. 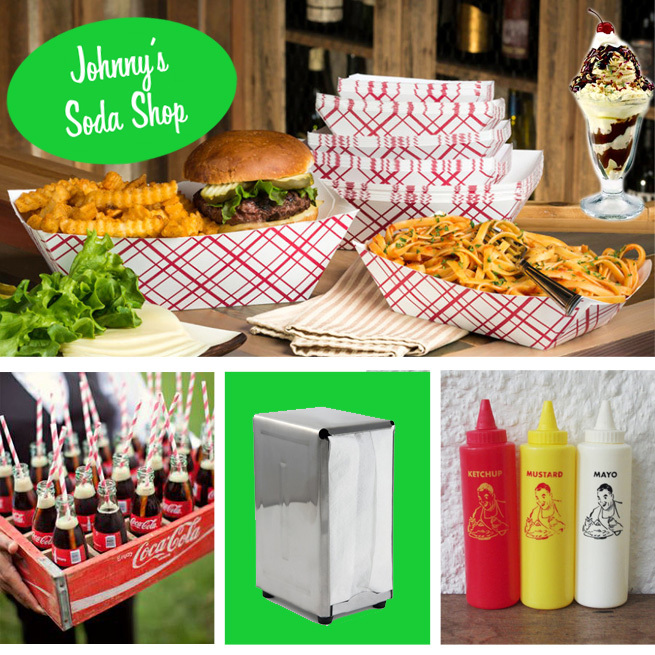 Start with the invitation using a fun retro font like and invite your son or daughter’s friends to celebrate his/her birthday at “Johnny’s” Soda Shop (using your child’s name). Be sure to make a big banner for the soda shop at the front door, living room or backyard. Serve up a cheeseburgers, hot dogs and fries in red and white checkered paper trays, along with coca cola in vintage bottles. Serve condiments in retro plastic squeeze bottles and use fold-out napkins in old-time dispensers. Have a gumball machine for some self-serve treats. Instead of a birthday cake, serve up ice cream sundaes, complete with whipped cream and cherries on top in sundae fountainware. What could be more fun? LEGOs!!! Perfect retro entertainment that’s STILL POPULAR! Playparty.net would love to set up and help out with LEGO stations. And send the kids home with a LEGO mini-figure or mini gumball machine party favor to keep the fun going. LEGO entertainment by Playparty.net, of course! Coming soon: Planes, Trains and Automobiles Birthday Party! *Playparty.net provides these links as a convenience for its readers and does not guarantee products or service of any third parties shared here.